After work today I spent and hour and a half mowing our new sod for the first time. It was looking like a little bit of a jungle. Birds were getting lost in the luscious vegetation and our poor Boston Terrior Nico has to bound like Bambi to get from one end to the other. Our yard is definitely shaping up to be a beautiful oasis. Getting side tract like that put me back a bit and I started dinner a little later that what I hoped as my son had a soccer game at 7:00pm so I knew I had to get crack-a-lacking and this crunchy little salad was done in less than 30 minutes start to finish. I prefer my eggs a little softer than hard boiled which added a nice creaminess to the dish. You could choose to make the eggs the night before but I also prefer them slightly warm. The family enjoyed the cubed ham but I chose to have mine with flaked tuna. If you prefer you could also choose left over chicken breast or flaked salmon. Once again, a salad made to order. There are 5.8g net carbs, 24.4g protein and 11 Weight Watchers points per serving. In a medium-size saucepan, heat olive oil over medium-high. Add onion and garlic. Saute till translucent. 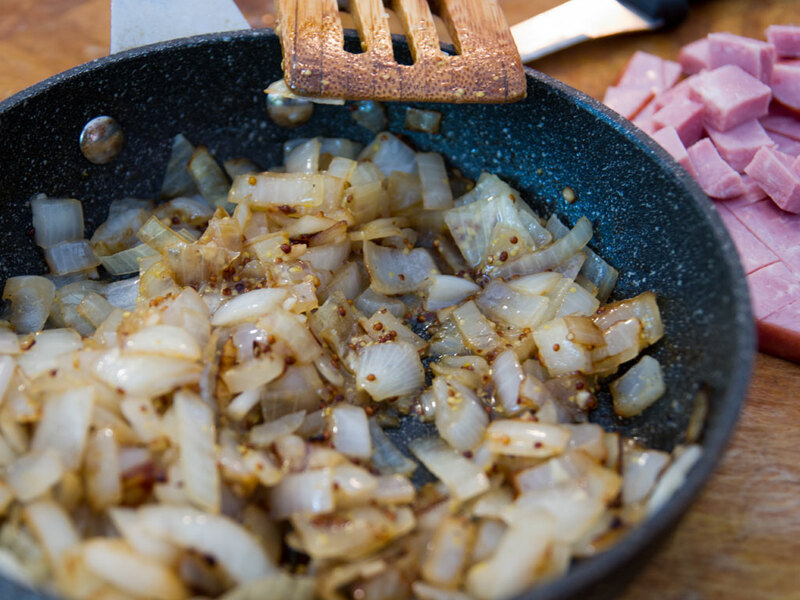 Remove from heat, and stir in vinegar, mustard, 3/4 teaspoon salt, and 1/4 teaspoon pepper. 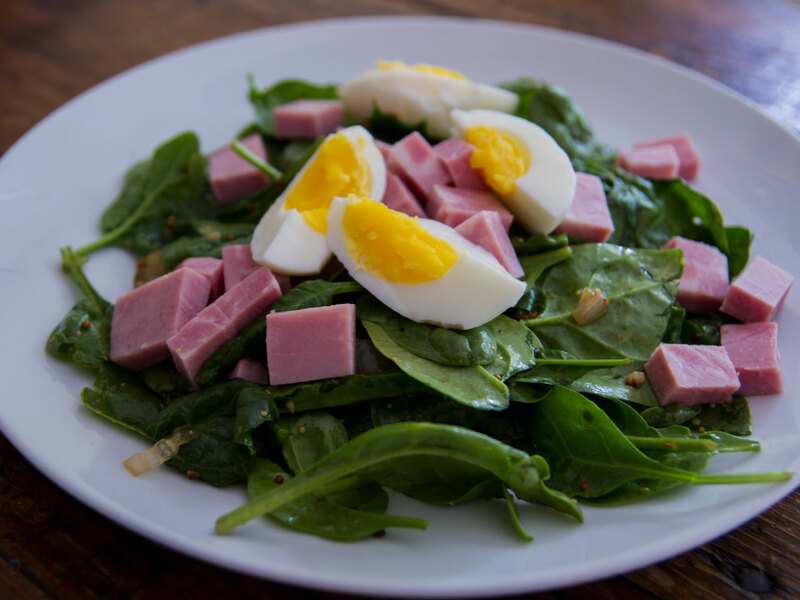 In a large bowl, combine spinach and ham. Drizzle onion mixture over salad, and toss to coat evenly. Garnish with hard-cooked eggs, and serve.